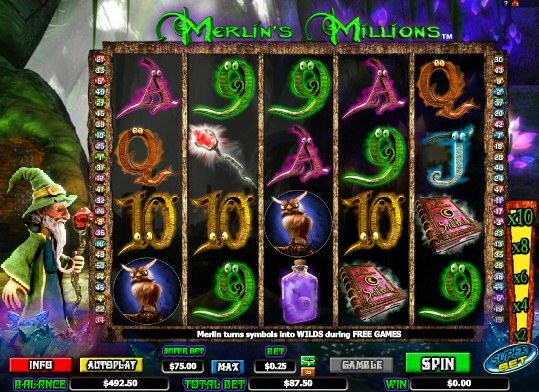 Merlin’s Millions is the NextGen Gaming developed slot based on the legendary tale of Merlin who was said to be the wizard accomplice of King Arthur. The slot comes with 5 reels and 50 pay-lines and was the product of an agreement between NextGen Gaming and Nyx Interactive. The slot has 3D graphics that give it a contemporary visual feel and also includes the innovative “SuperBet” feature. NextGen Gaming has seen previous releases including the Greek mythology themed Medusa and Middle Eastern themed Snake Charmer not quite hit the heights they expected but more recent releases such as the innovative Foxin' Wins have started to deliver with slots players across the globe. Merlin’s Millions is fascinating slot with symbols based on the myth surrounding Merlin and his role as a wizard in the King Arthur tale. Symbols include Potions, Owls, a Magic Cane, Spellbook and Merlin himself. One of the main features in Merlin’s Millions is the “SuperBet” feature. This is an optional feature that allows you to increase your Wild multiplier to give you the chance to win even bigger prizes. It’s a great addition to the Next Gen Gaming slot and something that would be great to see in other slots. Merlin himself represents the Wild symbol and substitutes for all other symbols except for the scatter symbols to complete winning combinations. It can appear stacked on reels 2, 3 and 4 giving you the chance of hitting bigger wins. There are two scatter symbols in Merlin’s Millions in the form of the Orbs and the Owls. If you hit three or more Orbs scatter symbols across the reels then you will trigger the free spins bonus round where you will be immediately awarded 5 free spins. During the free spins bonus round, Merlin can appear to turn certain symbols Wild increasing the potential for wins. There is the possibility that an entire reel could be turned Wild. If you manage to hit three or more Owl scatter symbols across the reels then you will trigger the Owl Bonus. These scatter symbols can appear on reels 1, 3 and 5. In this feature, all of the symbols on the reels turn into Owls and all you have to do is pick an Owl to reveal a prize. 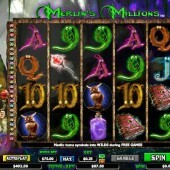 Merlin’s Millions is a slot with plenty going for it. There are so many features to trigger with lots of prizes to win. The potential rewards are not as high as other slots on the market but the excitement levels in Merlin’s Millions are rivalled by very few other slots out there. If you love your slots where anything can happen with each spin and you don’t have to wait long for something to happen then this slot is for you.